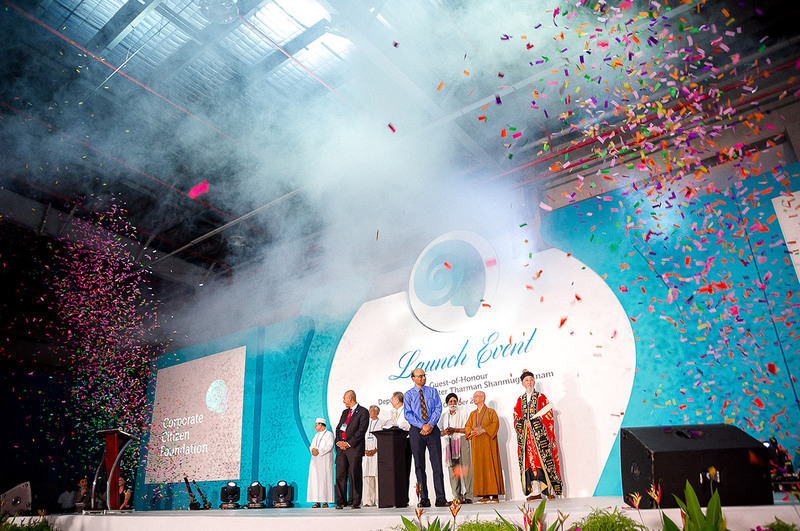 (above) Launch of the new and independent organisation, CCF, with the unveiling of its emblem, along with Special Guest Executive Director Said Faisal of the ASEAN Humanitarian Assistance Centre (AHA), CCF’s Chairman Lim Choo Leng, and Guest-of-Honour DPM Tharman Shanmugaratnam. Singapore, 1 November 2014 – With the widening income gaps and increasing occurrences of natural disasters in the region due to inter alia climate change, private enterprises could exercise a more pro-active, constructive and collective engagement to support the challenging socio-economic issues of vulnerable communities. To address this, the Corporate Citizen Foundation (CCF) seeks to be the platform for private sector players to do good better, together – for a better, safer and friendlier regional neighbourhood. On Friday, 31 October 2014, 6.30pm, Deputy Prime Minister and Minister for Finance, Mr Tharman Shanmugaratnam launched the Corporate Citizen Foundation (CCF) at the HSL Waterfront@Penjuru. A one-minute prayer for the safety and security of the regional neighbourhood led by inter-faith leaders, along with Guest-of-Honour DPM Tharman Shanmugaratnam and CCF’s Chairman Lim Choo Leng. CCF’s mission is to proactively enhance the capacity and resilience of vulnerable communities through sustainable livelihood and disaster management programmes. Part of the disaster management programme includes the Swift Emergency Evaluation Deployment (SEED). SEED seeks to bridge that first mile in acute disasters – where professionals and assets from relevant industries would be flown in on private air assets (owned by a SEED partner) to disaster locations to conduct and provide ground evaluations and information for other incoming responders, local and international. As the initiator of CCF, HSL Constructor has put in the seed funding of SGD 1 million. Over the next two years, HSL is seconding its staff to the CCF on a full-time basis; provide full secretarial and technical support through its Philanthropy & Sustainability division and allow the complimentary use of office space for the initial CCF HQ, to support the incubation of the new Foundation. Guest-of-Honour DPM Tharman, and Special Guest Executive Director Said Faisal of the ASEAN Humanitarian Assistance Centre (AHA), welcoming the corporate initiative to support the sustainable growth of and disaster risk management for vulnerable communities in the region, using corporate assets including funds, expertise and networks. SEED/CCF has already secured several key and reputable partners from relevant industries to commit their assets including airplanes, amphibious vehicles, civil engineering expertise, water filtration systems, media and regional ground network etc. Pioneer SEED partners inking their collective intent to help ‘bridge the first mile’ in disaster response. The ASEAN Humanitarian Assistance (AHA) Centre is aware of this initiative and is keen partner SEED/CCF. AHA would be sharing the CCF framework at this week’s ASEAN Ministerial meeting in Brunei. This basically closes the loop for the “Three P” approach for humanitarian assistance – Public (UN and govt agencies), People (NGOs and local communities), Private (companies) participations. HSL’s participation in the CCF Launch was featured on The Straits Times, Lianhe Zaobao, Berita Harian, Channel NewsAsia, AsiaOne, and TodayONLINE. To view the full articles, click here. Also, you may also view our TV coverage reports on Channel NewsAsia “Singapore Tonight”, Berita Suria, Vasantham, Channel 8 News, NewsOn5, and Channel U. Click here to view the playlist.